DROMANA have held Red Hill at bay to claim the 2018 MPNFL Division Two premiership at Frankston Park. The Tigers lost just two games for the entire year, with both their defeats coming at the hands of Red Hill. 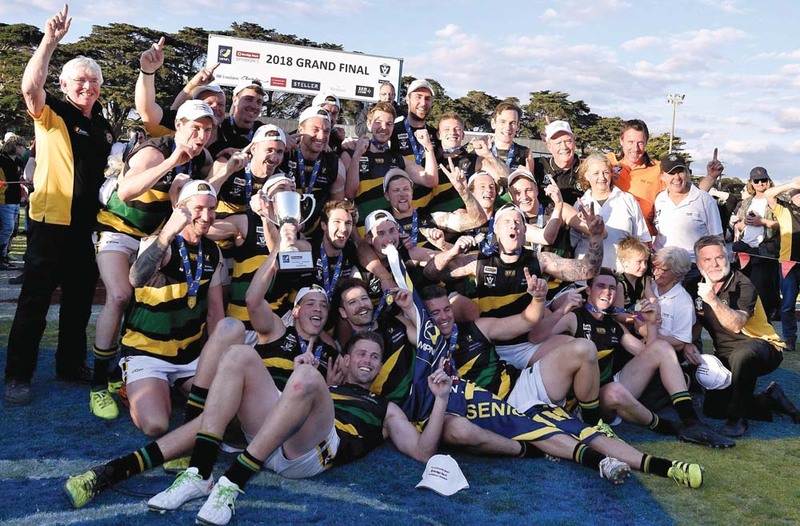 The Hillmen have improved in leaps and bounds this season under coach Jamie Mollo, and having defeated Dromana just two weeks earlier in their first final they entered the Grand Final full of confidence. Red Hill’s quest to claim their first premiership since 1990 hit a snag early, when Rheede Hopgood was struck down before the match with a calf injury. Andrew Mock came in as a late replacement. Things got worse for the Hillmen when Dromana held them goalless in the first quarter. Nerves were a big issue for Red Hill early, as they failed to hit targets and turned the ball over on numerous occasions going forward. Having not hit the scoreboard yet, they needed to hit the ground running in the second quarter. After the first break the Hillmen stormed back into contention, booting six unanswered goals to stun the Tigers. Jono Ross and Sean Marchetti led the charge for the Hillmen, booting five goals between them in just 15 minutes. After a sloppy start they started to hit their targets and look dangerous. Things were set to get even worse for the Tigers, as gun forward Ethan Johnstone exited the field holding his right shoulder. He was in visible discomfort, and ruled out for the remainder of the game. Down by two goals and needing someone to stand up in front of goal in the wake of Johnstone’s early exit, Dromana needed a hero to claim control of the match. Sam Fowler was the man to lead from the front for the Tigers, nabbing a goal just before half time and continuing to trouble the scorers in the second half. The Tigers recovered from their sloppy second quarter to claim back the lead early in the third term, and began dictating the play. Star defender Jonah Siversen was busy for Red Hill, but he could only do so much to stem the flow of Dromana attacks. By three quarter time the Tigers held a 13 point lead, but there was still plenty of noise around the Red Hill huddle. The Hillmen kept themselves in contention and were the better side in the final term, but ultimately were made to pay for their sloppiness in the first term. Coach Rikki Johnston stood tall late to kick the sealing goal for his side, as the Tigers clinched the premiership cup in a 9.5 (59) to 10.7 (67) thriller. Dromana will be taking their silky brand of football to Division One next season, as they have been promoted as a result of their premiership win. Rosebud have been relegated to Division Two.